In a few years from now, people would probably consider the majestic gramophone as a pre-civilization invention, thanks to the colossal onslaught of handheld technology. Portability has become the ‘apple’ of the eye, lean is in and lean in here to say. The music industry has always welcomed and adorned portable inventions with gadgets getting more and more sleek, smart and sassy. The iPad, from the product lines of Apple Inc, is once such avant-garde merchandise that redefined the experience of music. A line of tablet computers, iPad has established itself as a necessity among gadget freaks, techies, celebrities, musicians and the music loving hoi-polloi of today. Lyricists and Songwriters widely swear by its efficacy. Since its inception in April 2010, Apple iPad has been one of the most used mobile devices in the world. iPad is equipped with thousands of ‘apps’, a colloquial term of software applications aimed at catering to people with diverse tastes and interests. 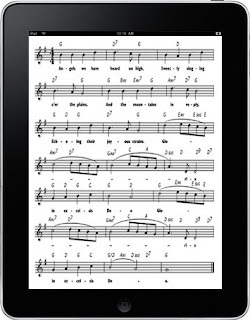 A Pandora box in its own way, iPad offers e-book reader, games, news, video, audio and two of the most important applications for musicians - audio recording and MIDI. The audio recording apps are mainly for music composers, arrangers and journalists. Some of the apps like 'FL Studio Mobile HD', 'VC Audio Pro', 'studio.HD' or 'GarageBand' allows one to sequence, edit, mix, master and produce her/his musical or audio works. Though the apps have to be purchased from the 'App Store' and downloaded to the device, they can be conveniently used as professional digital audio workstations (DAW). Most of the apps come with 8 to 16 track recorders, drum machines, virtual guitars, virtual synths, virtual amp modelers and virtual samplers. 'Recorder' is a very simple application from Retornyms and one of the most popular recording applications. Guitarists, Pianists or any other instrumentalists use iPad to enhance their musical abilities. Apps like 'Pianist Pro', 'JamPad', 'DM1 – The Drum Machine', 'Progression – Guitar Tab Editor' or 'SAS-1' help musicians to practice at home or on tour easily. Some of the apps found on the App Store are also known as digital multi-touch jamming machines and can play multiple instruments at once. One just needs to select an audio pattern, instrument like guitar and a chord and the instrument will start strumming automatically in sync with the tempo. One can switch to any chord, note, beat or tempo in real time. The iPad has the ability to record audio for broadcast, which has made it very popular amongst journalists, making them ditch their laptops and microphones. A journalist can record, edit and master an audio with the apps and the internal microphone and e-mail it from the iPad itself for a radio or television show or share it on Facebook, Twitter or Youtube page. As the iPad is controlled by a multi-touch display and uses a wireless local area network ("Wi-Fi") connection to access local area networks and the Internet, it becomes easy for anyone with little knowledge to handle it. The other interesting area is 'connecting MIDI controllers to iPad'. The Musical Instrument Digital Interface is a protocol that enables electronic musical instruments like keyboard or drum machine to communicate and synchronize with computers and other electronic equipment. Apple Camera Connection Kit or Line6 MIDI Mobilizer can be used to connect the iPad with any USB device that supports MIDI class and USB MIDI interfaces. Some of the MIDI apps for the iPad are 'Midi Monitor from iOSMIDI', 'AC-7 Core', 'NLogSynth PRO' and 'FL Studio Mobile'. There are millions of recordings done every day. People and bands who are on the go most of the time, iPad can be a valued device. The British virtual band Gorillaz's 2010 album, The Fall, was created exclusively using the iPad by the group founder Damon Albarn while on tour with the band. Using a small portable mobile device for recording can be humorous to the traditional musicians, audio engineers and live journalists. But it is not very far when the tablets like iPad, Samsung Galaxy Tab or the HTC Flyer will become household devices exercising power or authority over the music and recording industry.